Wamego's historical complex sits at the eastern edge of Wamego City Park and includes a complex of authentic buildings from the 1800s. 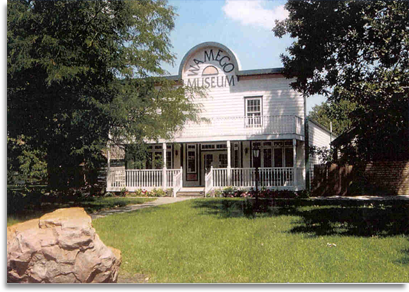 The history museum traces the evolution of Wamego and Pottawatomie County from the first inhabitants, the Konza and Pottawatomie Indians, to the history of the Underground Railroad in the area, and items from the Columbian Exposition of 1893. 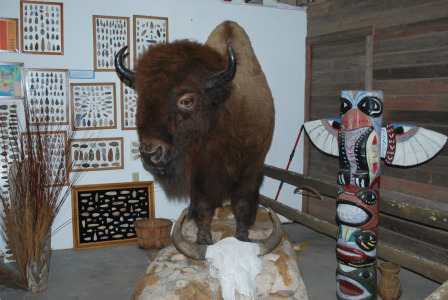 A full-body taxidermy buffalo named Abigail is on display at the museum. Abigail was a twin born near Paxico, Kansas. Her mother abandoned her in favor of her twin brother, so she was bottle fed by her human family (aka, her owners). She was raised by her owner's daughter and when she became a little too frisky, she was turned out with the herd until her death at the age of 15. Because of the family's attachment, the decision was made to have her body preserved by a taxidermist, and in 2004 the Museum acquired her for all to see and enjoy. 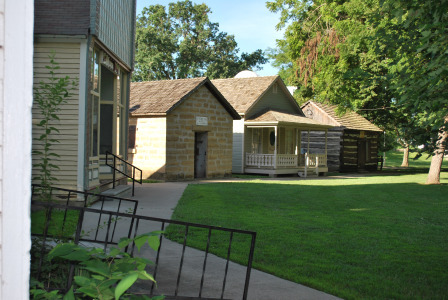 This Historic Village (partial shot above) consists of buildings moved in from across the county, including a one-room schoolhouse, a log cabin built in the late 1850s, the first jail in Pottawatomie County, and several other historic buildings, which sit nestled under large cottonwood and sycamore trees along the east side of City Park. The park is also home to several statues from the Columbian Exposition and is one of the top-rated picnic spots in the state. One and two-day tours of the Wamego area are also available upon request. Monday-Saturday: 10 a.m.-noon and 1 p.m.-4 p.m.